In July 2007, Mattel announced that their DC Superheroes line was now able to encompass the entirety of the DC Universe, rather than just Batman and Superman. However, with many of their recent series, Mattel seems to have imposed restrictions on themselves, limiting the last three series of figures to characters relating to the Man of Steel. Finally, after a ridiculously long wait, Mattel has gotten around to another Dark Knight themed series, and (if the package back is any indicator) it seems like they're spreading it out over two or possibly even three mini-series. While the cardback shows a whole slew of new characters never before released in the DCSH line, the first mini-wave only features two newbies (Two-Face and Cassandra Cain Batgirl). The other spots are filled with a retooled "Shadow Knight" Batman and a repainted "Camouflage" Bane. However, "new character" doesn't necessarily mean entirely new figure. Re-use has been fairly common in this line between characters (the "standard" versions of Bats and Supes both feature some shared pieces), but nowhere has it popped up so prevalently as it has in this series. Take Two-Face, for example. Harvey Dent, Gotham City's district attorney, was a friend to Batman until a horrible tragedy left his body and mind horribly scarred. The nature of said scarring differs depending on which continuity you believe in, but the end result is the same: a split-personality maniac obsessed with the number two. 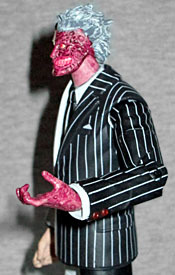 While every single bit of clothing used for Mattel's Two-Face is the exact same sculpt as their previous Clark Kent figure, there's a clue that seems to reveal that the body was originally intended for Harvey in the first place: looking at the tie on the Clark figure, you can see a sculpted line right down the middle. Doesn't make a whole heck of a lot of sense on a normal necktie, but on Two-Face's two-toned tie, the true intention becomes clear. The Four Horsemen tend to pull from lots of different inspirations when they sculpt comicbook characters, and ol' Facey is a prime example. The hair, sticking straight out from his head on the scarred side, seems to be inspired by Kia Asiyama's take on the character. The pinkish skin is reminiscent of Tommy Lee Jones's portrayal of Harvey in Batman Forever, Joel Schumacher's first attempt at initiating the apocalypse via making a mockery of the Dark Knight. Finally, the all-over scarring of the left side of his body, rather than just the face being scarred, fits Two-Face's appearance in the DCAU. It's all sculpted mighty nice, and I can't remember the last time a figure so hideous was available at mass market stores, although off the top of my head I'd say probably not since the Marvel Legends 7 melting head Ghost Rider chase figure. [you have a very loose definition of "available" --ed.] The unscarred face, thankfully, is fairly handsome and not too exaggerated in its expression. Most figural attempts at Two-Face tend to over-dramatize his facial expression into a hideous grimace, forgetting that the pre-scarred Harvey was supposed to be quite dashing. 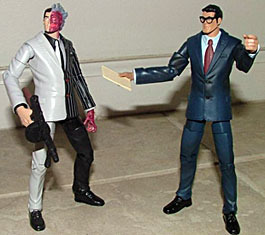 The Clark Kent body, with its slightly hunched posture, befits a gangster like Two-Face much more than a stand-up reporter like Clark, which is perhaps another indication of whom this body was originally meant for. The only hang-up I have is that there's a handkerchief painted in his left breast pocket, with no sculptural basis. I usually hate when elements are painted on without being sculpted as well, but since it's just the vaguest hint of a kerchief, I can let it slide. The paint is pretty good technically for a mass market release. The stripes on his suit are particularly impressive; each line is clean and unbroken, though for some reason they don't continue onto the pants. In contrast, the white half of his suit is stark and clean, with no scuffs or slop to speak of. The strange magenta used for his face, while it may be pulled from Batman Forever, is also probably an attempt to de-gross-ify the scarred bits by making them less realistic, and thus less likely to incur the wrath of a complaining parent. It doesn't look too bad though, and it doesn't obscure the detail. What does look kinda bad though is the hot pink used for his iris, gums, and, inexplicably, on his teeth. Harvey moves with a balljoint in the head, balljoints in the shoulders, pegs in the biceps, hinges in the wrists, a peg waist, pegged and hinged hips, peg thighs, hinged knees and hinged ankles. It all works well, except for the neck, which has a range of motion more reminiscent of a peg joint than a ball. As such the figure can't look down, and seems to have his head tilted slightly back at all times. For accessories, Two-Face gets a tommy gun and a lame backdrop. At least the backdrops aren't universal anymore: rather than a generic green explosion, Two-Face's cardboard diorama features a generic orange flash of light in a deserted Gotham alley. His tommy gun is nicely sculpted, and can be held in both hands if you really try. It's painted with a sparkly, two-toned sort of gunmetal, and while they get points for trying, the effect is not as good as it could be. The stock of the gun is a uniform brown. Sadly, Two-Face doesn't get any coin-related accessories, though I'm sure anything that small would be an immediately red-flagged choking hazard. However, they could have sculpted a coin in his hand a la DC Direct's Long Halloween Two-Face figure. Alas, they didn't. 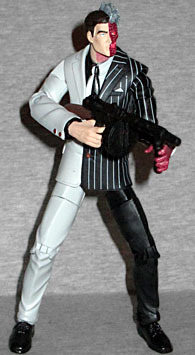 Still, Two-Face is a pretty cool figure. Bright pink and magenta coloring aside, it's good to have another highly poseable, nicely sculpted rogue to fill out my gallery of DCSH Batman villains. While most of this figure is a repaint, it's repaint that works fairly well, and there are quite a few hints that seem to reveal that this body sculpt is actually meant for Two-Face, thus Clark Kent would be the true repaint... a pre-paint, if you will (and it shows, considering how un-Clark-like that figure was). The color may not be your thing, but it shouldn't be too hard to redo the face, even for the novice customizer.